Rising artist Kiiara hits the road on her headlining tour! Rising singer-songwriter Kiiara, who's currently taking the world by storm with tracks including 'Gold' and 'Messy', is hitting the road this fall on her headlining tour. 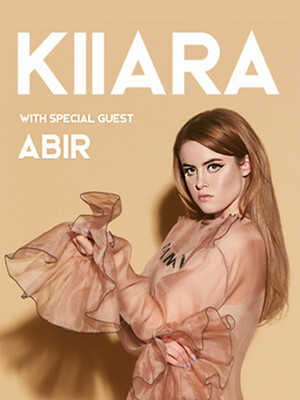 Joining Kiiara on the road, the soulful funk style of emerging artist ABIR and she's bringing her powerhouse vocals with her. Kiiara's name first landed on everyones lips when she released her debut single 'Gold', which peaked at number 13 on the Billboard Hot 100. The video which followed 'Gold' quickly gained popularity when it reached over five million views. Since then, Kiiara hasn't stopped - she's already toured with The Chainsmokers and has performed at festivals including Coachella and Lollapalooza! Siting Eminem, Linkin Park and Rihanna as her influences - there's no doubt that Kiiara's tracks has been called the sound of summer. Seen Kiiara? Loved it? Hated it? Sound good to you? Share this page on social media and let your friends know about Kiiara at U Street Music Hall. Please note: The term U Street Music Hall and/or Kiiara as well as all associated graphics, logos, and/or other trademarks, tradenames or copyrights are the property of the U Street Music Hall and/or Kiiara and are used herein for factual descriptive purposes only. We are in no way associated with or authorized by the U Street Music Hall and/or Kiiara and neither that entity nor any of its affiliates have licensed or endorsed us to sell tickets, goods and or services in conjunction with their events.